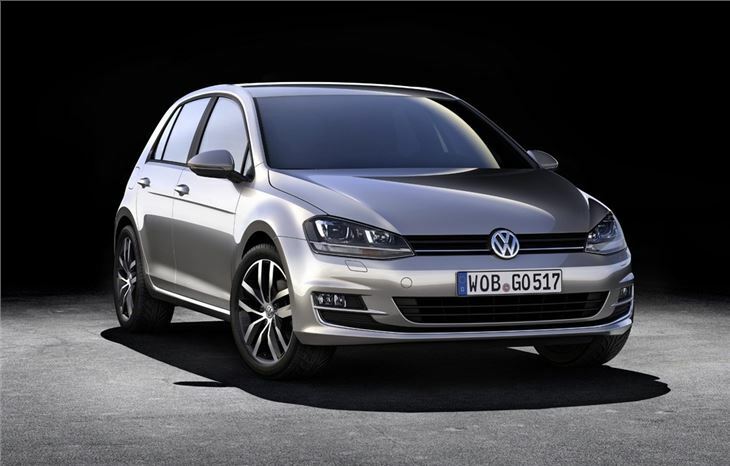 Volkswagen has officially unveiled the new Golf which goes on sale here in January next year. The latest generation of the popular hatchback was revealed at an exclusive event in Berlin where we were lucky enough to be present. 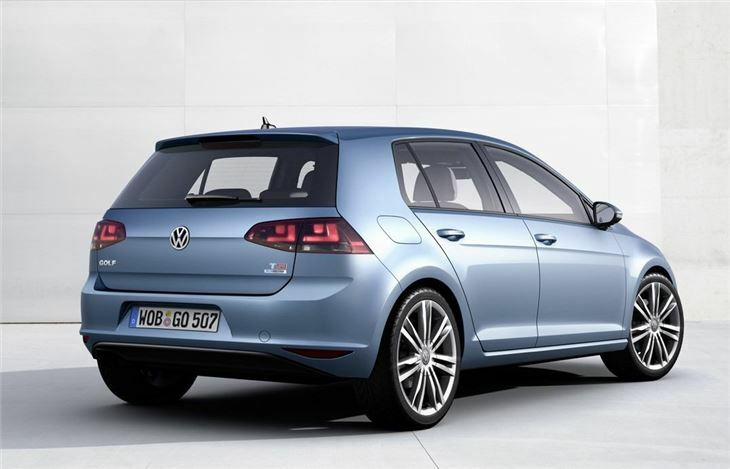 The current Golf was launched just three years ago and although described as 'new' it shared much with the model it replaced. This seventh generation of the model is completely new, sharing the same platform as the new Audi A3 and the forthcoming SEAT Leon. It's not exactly a big departure in terms of styling but Volkswagen has always played it safe with the Golf and this latest version is no different. It's unmistakably a Golf but does get a few creases in the bodywork, notably at the side and on the tailgate, to give it a sharper look. It's longer than the outgoing model and marginally wider too but it's the longer wheelbase which makes the biggest difference for interior space. The front seats are now further back meaning more room for taller drivers and front passengers but this doesn't cut rear space. In fact there's now slightly more rear legroom plus the boot is bigger - up 30 litres to 380 litres - with a low sill to make loading easier. Volkswagen is well aware that the competition to the Golf is stronger than ever, mentioning the latest Ford Focus as a big rival particularly in terms of quality, refinement and value for money. As a result it has focussed on the quality of the interior as well as standard equipment levels. Inside it's fairly similar although the central stack is now angled more towards the driver, there's a redesigned steering wheel and the stereo unit is new too, with a 5.8-inch touchscreen standard on all models. The traditional handbrake has been replaced by an electric parking brake which frees up space. The engine line-up is familiar with all the engines getting start/stop and battery regeneration to aid efficiency. 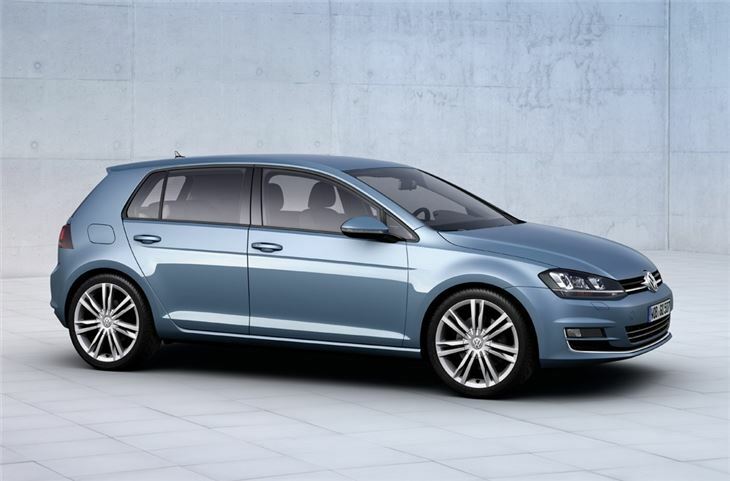 To start with the entry-level model will be a 1.2 TSI with 85PS that can average a claimed 57.6mpg. Moving up there's the 1.4 TSI with 140PS that comes with Active Cylinder Technology - a system we've actually tested on the Audi A1. The diesels will be ever popular with the 1.6 TDI with 105PS returning a claimed 74.3mpg with emissions of 99g/km meaning zero annual VED and exemption from the central London congestion charge zone. The BlueMotion version uses the same 1.6 TDI but with 110PS and thanks to various efficiency changes has economy figures of 88.3mpg with CO2 of just 85g/km. There is also the 2.0 TDI with 150PS that averages an official 68.9mpg with CO2 emissions of 106g/km - mightily impressive figures for its size and power. Despite being bigger the new Golf is actually lighter - 100kg lighter to be exact which means it now weighs the same as the fourth generation Golf. This will mean better fuel economy and should benefit handling too. 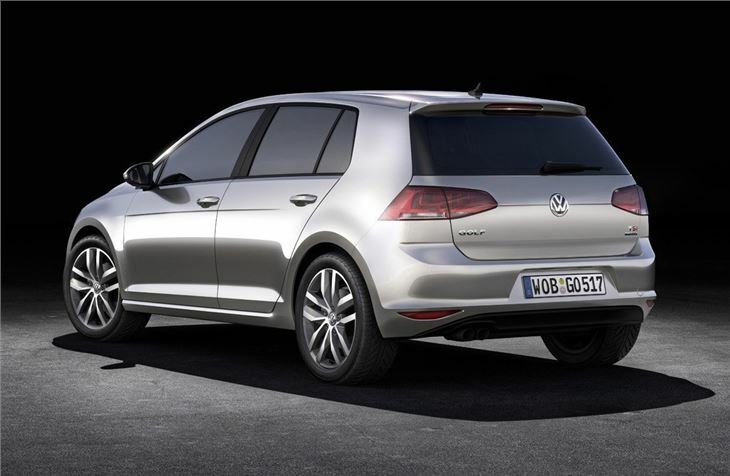 The current Golf has been criticised for its steering so this new model has variable ratio steering system designed to give more agile steering along with easy manoeuvering at low speeds. Along with a stronger body structure the new Golf also comes with a multi-collision brake system as standard on all models. This automatically brakes the vehicle after a collision, to reduce kinetic energy significantly and thus minimise the chance of a second impact. Other technology includes Adaptive Cruise Control which is standard on SE models and above along with Front Assist, which can bring the vehicle to a complete stop and operates at up to 90mph. There is also City Emergency Braking, which works at up to 19mph to help reduce or prevent accidents. Details about prices and specifications will be released nearer the Golf's on sale date but it's expected to cost from around £16,000, similar to the current model. - The seventh generation Golf is bigger than before which means better interior space but it's also lighter which is good news for economy. - The 1.6 TDI averages a claimed 74.3mpg compared to 62.8mpg in the current version. 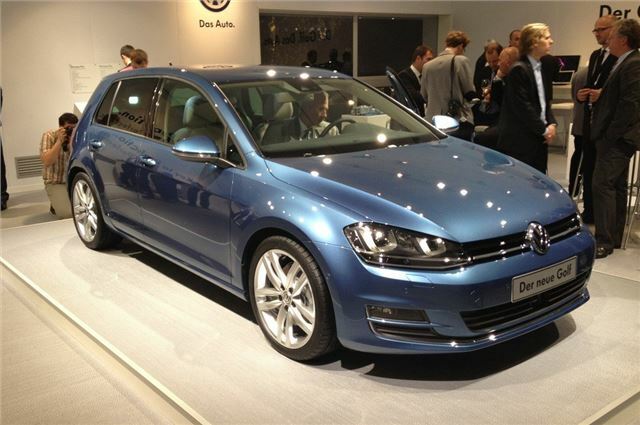 - The BlueMotion version will return an official 88.3mpg with CO2 emissions of just 85g/km. - There's more room for both front and rear passengers thanks to a longer wheelbase. - It will be available to order in October this year with the first cars due to be delivered in January 2013. - Prices are expected to start at around £16,000 - the same as the current Golf. - The GTI version will be show (albeit in 'concept' form) at the Paris Motor Show later this month. Predictably nice, well rounded package, not enough to get me out of a next generation SEAT Leon though which shares the platform, tech and adds nicer looks for less money, does it for me! All we need is a high output TDI.